RUSH: Oh, by the way, speaking of this, I meant to mention this in the opening half hour of the program. I didn’t get to it. 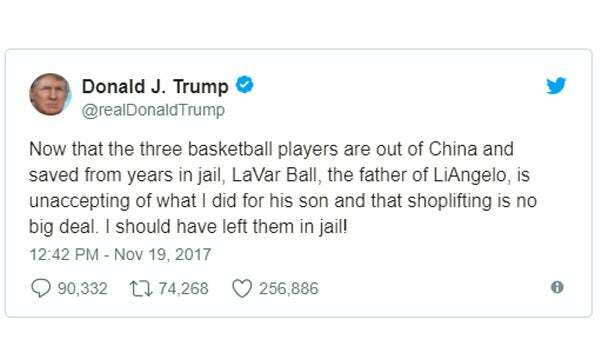 This controversy over Trump’s tweets about the three UCLA basketball players. A bunch of people are coming out saying this proves that Trump is racist. What did Trump say in these tweets? “What was he over there for? Don’t tell me nothing. Everybody wants to make it seem like he helped me out.” That was LaVar Ball. So now they’re saying that Trump’s tweet about maybe leaving ’em in jail is racist? And that anybody who attempts to defend Trump’s tweet is also racist? I mean, these muckrakers at Media Matters just lying in wait for anybody. What is racist about it? Once again, I have to dissent from that a little bit. I think this is just another example of how Trump happens to capture — what this is about is gratitude. It isn’t about race. It isn’t about anything other than simple manners and how we’re raising people without them, it seems, more and more.